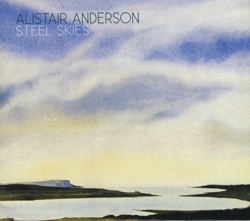 Scored for a group of musicians including fiddles, flutes, mandolins and Alistair Anderson’s concertina and Northumbrian smallpipes, Steel Skies is a magnificent suite of composed tunes with roots deep in the traditional music of the British Isles. The compositions take from the tradition but expand on it creating a rich and rewardingly-subtle whole. Originally released in 1982, this wonderful album has a justly sterling reputation among those who have heard it, calling out for a re-release on CD. Alistair Anderson’s mastery of the concertina is legendary, but it is the concept and the beauty of the music here that may take your breath away. “This is new music but with its roots deep in the traditional music of the British Isles. The traditional musician takes old tunes and polishes them like gemstones, revealing new facets of the melodies at every turn. The vitality such musicians bring to their music has always been an inspiration to me, and Steel Skies is a personal response to this.” – Alistair Anderson.